From the back of the box: Gobble up, line up and win! 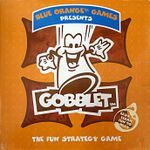 Gobblet is a fun strategy game with a simple goal: you will be given Gobblets of different sizes which you need to line up 4 in a row. But watch out! Your opponents will try to gobble up your smaller pieces with their bigger ones to keep you from reaching your objective. Do not worry too much though; Gobblet is a fair game, and you'll have a chance to gobble them back on your turn!